News of a proposed highway cutting through front yards and entire homes in El Sereno, and Highland Park’s Garvanza and San Rafael neighborhoods generated a flurry of community opposition this month. “This is one of the oldest neighborhoods in L.A. It’s over a hundred years old. And all of a sudden they want to take it away from us,” Alex Trejo, who has lived in northeast Los Angeles since the 1970s, told EGP on Monday. He and nearly 300 other Highland Park residents, impatient for answers about the fate of their homes and their neighborhood, flooded the Ramona Hall Community Center on Monday, overwhelming a routine community liaison council meeting for the project, as well as karate and yoga classes taking place there. A karate instructor, dressed in a traditional Gi uniform, was kept busy directing the tangle of cars trying to get into the center’s modest parking lot, while a community center employee said he has never seen quite this many people, even on days they rent out the facility for special events. The proposed highway route stirring up Highland Park residents would widen streets in several residential neighborhoods. One of the widest portions goes through Avenue 64 where the Garvanza and San Rafael neighborhoods, home to numerous historical homes, are located. The route also goes through residential streets in El Sereno, such as Sheffield and Concord, follows commercial streets such as Fremont Avenue and Monterey Road, and connects to the 134 Freeway. The route through Highland Park is one of twelve possible alternatives being considered for inclusion in an environmental impact study for the proposed 710 Freeway project spearheaded by Metro, Los Angeles County’s transit authority. The technical advisory board for the study had planned to narrow down the list by Aug. 29, but this past Monday revised the deadline to mid-October. Caltrans “anticipates completing The Alternatives Analysis phase of the SR 710 Study by the fall (2012); circulate the Draft environmental document and conduct public hearings by the winter of 2013 (1st quarter of 2014); and then finalize the environmental document by the winter of 2014 (1st quarter of 2015), according to Michelle Smith, P.E. Project Manager. Attempts to connect the 710 freeway from its terminus in Valley Boulevard in Alhambra to the 210 Freeway in Pasadena have failed repeatedly over the last five decades, and this time around, with the list of alternatives making the rounds at technical advisory meetings, residents and activists are again coming out in force to oppose the latest proposed project, which now has an expanded study area that includes the 5 Freeway to 605 Freeway, east to west; and 10 Freeway to 210 Freeway, from south to north. Efforts to connect the 710 and 210 freeways were revived with the suggestion that a tunnel could be built to close the gap; prompting drilling and geotechnical studies throughout the project area to explore the idea. But with no guarantee of funding, and the possible high cost of building a tunnel, Metro’s list of twelve alternatives also now includes cheaper highway (widened streets) and freeway options, the very type that have incensed residents in the past. Other alternatives include light rail or bus rapid transit routes, as well as a “no build” alternative in which the roads would remain as they are. Residents at Monday’s meeting demanded a better justification for the project, all the while ignoring requests by Metro’s community outreach officials to hold their questions until the end. Officials trudged through a presentation on the results of several community meetings held back in May, and showed two videos on possible routes –during which residents continued to ask questions about why the routes were even being proposed. Metro officials said there were no technical staff members present to provide answers to those questions. In the past month, northeast Los Angeles residents who learned of the possible route have passed out flyers, circulated emails, and gone door-to-door to share the information with their neighbors. They crowded into community and Metro board meetings to protest the project, which would connect the 710 Freeway with the 210 or 134 Freeway. The Historic Highland Park Neighborhood Council also voted to oppose the project. Many of the protesters at Monday’s meeting opposed the project outright, and supported the “no build” alternative. Several were also skeptical of Metro’s claims that the project’s main goal is to relieve congestion. Supporters of the “no build” alternative say they want to keep Metro from pitting communities from different parts of the project area against each other. 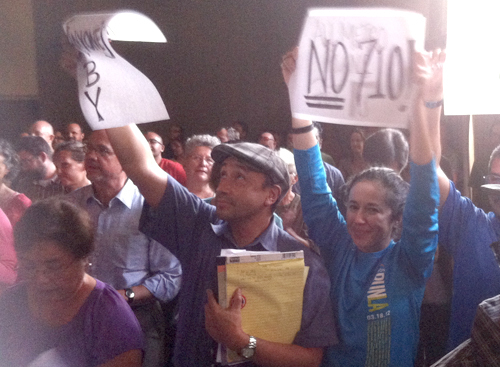 “I think they are trying to balkanize the communities against each other,” said Highland Park resident Gloria Castro. Several residents accused elected officials, in particular Los Angeles Councilman José Huizar and Assemblyman Gil Cedillo, who have said they oppose “surface routes,” of hiding behind the language. Some of the sub-surface routes, such as the tunnel or covered trenches would still change the character of the streets along the route, they said. Others accused Metro officials of not providing the traffic and air quality statistics to support the project, and said officials were being dishonest about the purpose of the freeway. Highland Park resident Peter Bedard said the project would actually be a “toll-way” paid for with tax dollars, and that its main purpose is to transport cargo from the Los Angeles and Long Beach ports inland. “Please talk to us from that point of view. You need to have it spoken to us in a way that is clear, authentic and transparent,” he said. But Caltrans officials, responding to the uproar over the project and the route affecting Highland Park, are continuing to stress that no final decisions have been made and the proposed routes are still only concepts. “The Highway/arterial improvements proposed for Avenue 64 is one of the many SR 710 Study alternative concepts under review,” Project Manager Michelle Smith stated Wednesday in an email to EGP. “All of the SR 710 Study Alternative Concepts are still under review. No final decision about any alternative or route has been made.” Smith emphasized. Thanks so much for your coverage. At this point, your translation of this article has done more to educate Latinos than the PR firm earning $3M. Gracias! I will distribute your article.